LAS VEGAS, Oct. 23, 2017 — (PRNewswire) — Sina Corporation released its 3D augmented reality mobile application on October 18, 2017. The application is powered by Remark Holdings, Inc.'s (NASDAQ: MARK) proprietary 3D facial-feature-tracking technology. "Artificial intelligence is the most exciting and disruptive force in technology today. It has the power to rapidly change business fundamentals," stated Kai-Shing Tao, Remark Holdings' Chairman and CEO. "Remark's AI technology platforms are on the forefront. With global corporations like Sina valuing our innovative and scalable solutions, monetization opportunities abound." 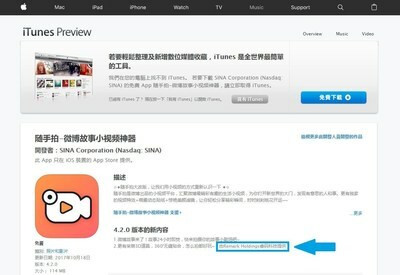 Remark Holdings is credited for its artificial intelligence technology in Sina's developer notes in the iTunes App Store. Please see screenshot below. Sina's Chinese press release regarding the mobile application may be found here. The press release references Remark Holdings and its technology platform.